Pyracantha fortuneana, Graber’s Pyracantha, is widely known for its use in creating beautiful espalier specimens that bring a sense of formality and drama to any landscape. 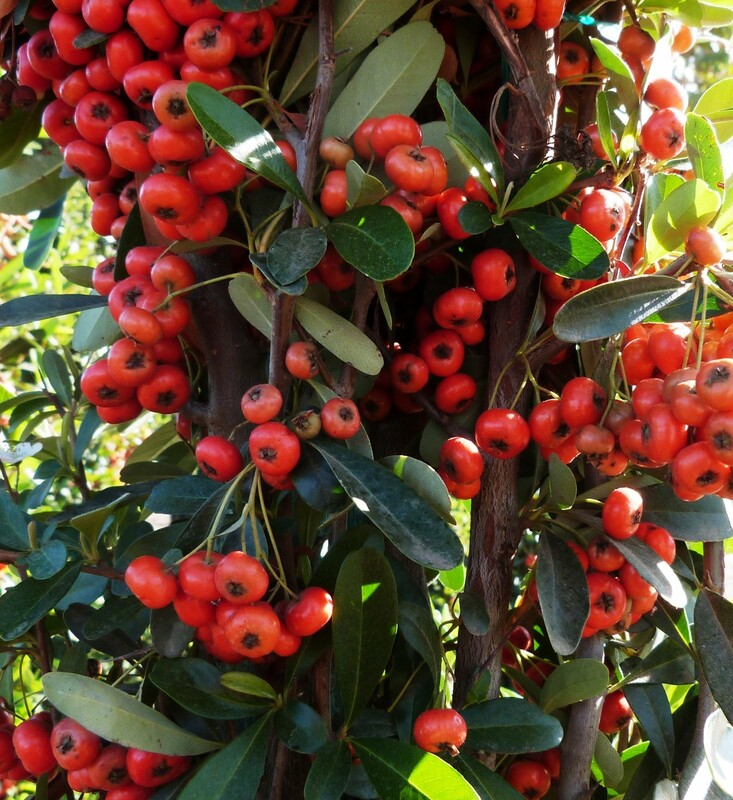 This pyracantha can also be used as a container specimen, windbreak, or hedge row in the landscape. Its lustrous dark green foliage is evergreen and oval in shape. Each leaf is about an inch long and foliage is beautiful year-round. Graber’s pyracantha blooms profusely with small white flowers in clusters during the spring, attracting a multitude of bees and other pollinators. Before winter arrives, bright red berries forms in clusters and serve as an excellent food source for local and migrating birds. However, you’ll need to take care when handling Graber’s pyracantha: This handsome specimen is armed with thorns that can reach to 1.5-inches long, so you’ll also need to be thoughtful when choosing its location in a landscape. Graber’s pyracantha is drought tolerant once established and can tolerate a good deal of radiant heat from hard surfaces. This pyracantha does best in full sun, but will take light afternoon shade. Keep tip-pruned to maintain a formal shape, espalier or to simply keep plants in-bounds. Though virtually pest and disease free, fireblight can be an issue under the right environmental conditions.